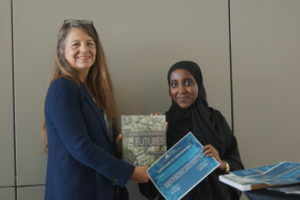 Alifa Muneredeen, Award for Outstanding Graduate Student Participation in the Round Table and Blue Urbanism, Sustainable Urbanism Next Generations Awards for Volunteers and Student Participants, 2016. © Qatar University. Abdulla Al Naimi (Architect), Award for Outstanding Volunteer Service to the Workshop for production and design of the programme, booklet and for general support to the organisers, 2016 Sustainable Urbanism Next Generation Awards © Qatar University. 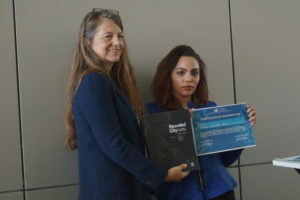 Mariam Hassan, Award for Outstanding Undergraduate Student Participation in the Round Table, 2016 Sustainable Urbanism Next Generation Awards. © Qatar University. Shimaa Abdelkarims, Award for Outstanding Undergraduate Student Participation in the Round Table. 2016 Sustainable Urbanism Next Generation Awards. © Qatar University.